Envie de vous évader du moyeu-bub trépidante de la ville, être entouré par la nature et pourtant avoir tous les conforts de la maison? Soyez notre invité dans cette cabane en rondins confortable entouré de grands pins et les montagnes, et mais encore une courte (six milles) conduire les casinos, le lac, golf, shopping et plus encore. Apportez votre vélo car il ya plusieurs pistes cyclables à proximité, ou tout simplement marcher jusqu'à la prairie à quelques pas de la cabine. Nouvellement rénové à l'intérieur et à l'extérieur, de nouveaux appareils en acier inoxydable, pierre carrelage, intérieur en pin noueux, des lits de style cabane en rondins, dort huit personnes confortablement. Grands vue sur la montagne, une grande terrasse, barbecue, un piano, câble, DVD / VHS, jeux, Internet WiFi et approvisionné avec beaucoup de films (y compris plusieurs films de Disney pour les gamins). Il ya une grande cour boisée et quatre grandes fenêtres sur le côté ouest de la cabine sans voisins à bloquer votre point de vue de magnifiques vues sur la montagne et à proximité prairie. L'allée peut accueillir quatre voitures avec plus de place sur la rue. La cuisine est entièrement équipée avec une batterie de cuisine, ustensiles, assiettes et autres objets à manger. Serviettes, linge de maison et de toilette sont fournis. Se il vous plaît noter: nous ne acceptons les réservations et les paiements en ligne sur notre site. Juste renseigner pour plus d'informations! Wonderful experience! Two families, we and a close friend's, stayed in the property for reunion and spent a fantastic Christmas holiday. The cabin, especially the living room, is very spacious, and very comfortable to stay in. It is very well maintained and very clean. Also quiet but quite convenient location, not very far from most sites, e.g. ski resort, supermarket, Emerald bay for sure seeing. Highly recommended for a family or group's stay. We spent 2 nights with my brother's family. This is a lovely and spacious rustic cabin. Well furnished. No surprises. The large log dining table is special. Highly recommended. Thanks again for being our guest! Glad you guys had a good time and enjoyed your stay. Awesomeness. This place is amazing. Our family had an amazing vacation. This cabin was everything it was promised to be. It was the perfect size for our family of four. The property was clean and well maintained. The owner has a book that has great and helpful information in it. I would recommend this cabin, no doubt. If in the area again, we would not hesitate to rent here again. Thank you again for our wonderful lodging. Thank you for the kind words and thanks again for being our guest! We hope the next time you plan a trip to Lake Tahoe you think of us! 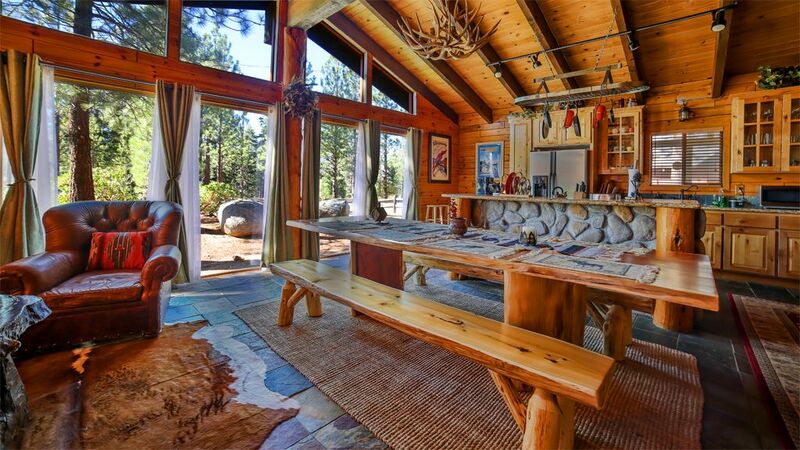 Quaint and cozy house to stay in South Lake Tahoe. Located in a quiet neighborhood with access to skiing and restaurants. The house was clean and provided ample space for 4 people. Thanks so much for your kind words, Kelly! We're glad you enjoyed your stay and hope you decide to stay with us again on your next trip to Lake Tahoe! We wanted a vacation where the family could relax and enjoy the snow and this was the perfect place! My husband and I loved the openness of the cabin and that we could keep and eye on our little ones. The place was clean and had everything we needed to enjoy our week! The cabin is not too far from restaurants and shopping but we still loved that we had the feeling of being in the woods with a great view. This is a great cabin to stay at. It was clean and well maintained. The description was very accurate. I liked how cozy it was and the big windows to let in the natural light. The owners were great! They responded quickly to my texts and were always friendly. We didn't go anywhere or do any activities. We picked the weekend where it rained and rained. Lol. We left a day early because I got sick. But that has nothing to do with the cabin. I thought the cabin was in a great location and would definitely come back. If I had to pick one negative of the cabin it would be needs more lighting at night. It's a little dark. But that's just me, I like a lot of light. So this may be a non issue. Would I recommend this place? Absolutely!! Thank you so much Ryan and Darnie for letting us stay in your beautiful cabin!